A patient is referred for a computed tomography (CT) study to investigate the cause of a chronic cough. The patient declines, citing prior CT studies and a concern for being exposed to ionizing radiation. Six months later, the patient is in the ER and diagnosed with advanced lung cancer. “As radiologists, we need to take the driver’s seat in educating patients and referring physicians on medical ionizing radiation so they can make informed choices,” says William Moore, MD, a radiologist at Stony Brook University Hospital (Stony Brook, NY) and developer of Scannerside (East Setauket, NY), a cloud-based radiation-dose-monitoring solution. Dr. Moore cites the above story, based on actual events, as an important reason for implementing dose monitoring solutions to ensure patient safety but also to help educate patients and referring physicians. Dose monitoring solutions capture patient-specific dose information, either directly from the modality or through the RIS, PACS, or EMR. Some solutions are web- or cloud-based, and most provide capabilities that help to fulfill compliance with dose-monitoring requirements imposed by regulatory agencies, accrediting organizations or legislation, as well as provide reporting capabilities to the American College of Radiology (ACR) Dose Registry Index. According to a recent press release announcing the availability of a report on radiology dose monitoring solutions, KLAS found that the interest level for these solutions is high. Of 100 respondents, 83 percent either have purchased or are seriously looking for a solution. Of those, 65 percent are planning to purchase a solution within the next two years. Informed choices can help drive quality and safety in medical imaging. At Rush University Medical Center (Chicago, IL), Mark Supanich, PhD, uses Radimetrics Enterprise Platform (Bayer HealthCare, Toronto, Ontario) for quality assurance. “Dose monitoring is very useful for identifying studies that are outside the normal ranges, so we can then investigate them and determine what actions are needed to prevent future occurrences if any action is needed,” he explains, noting that sometimes a CT study is outside the normal dose range for valid reasons. Dr. Supanich finds the IHE profile for Radiation Exposure Monitoring is helpful for capturing complete data on a CT study. Yet he believes that with a dose monitoring solution, summing up the effective dose on a particular patient is not necessarily the primary benefit. Rather, it is the ability to identify a certain patient population that may be receiving numerous CT studies—such as patients with ventriculoperitoneal shunts—and better manage those patients’ dose levels by examining the image quality and dose needs to ensure quality and optimize radiation dose. The Joint Commission’s revised standards will also require CT radiation dose documentation in the patient’s clinical record and pediatric-specific imaging protocols. Marilyn Goske, MD, FACR, a radiologist at Cincinnati Children’s Hospital Medical Center and founder and chair of the international Image Gently® campaign, has helped spearhead child-size protocols throughout the radiology and pediatric communities. In addition to justifying the exam and optimizing the dose for children, Dr. Goske explains that the industry is now moving toward developing diagnostic reference levels. “The idea is to provide a target range for hospitals so that they are not only monitoring the dose delivered, but have a reference point for where the dose should be, similar to a speed limit,” she said. However, where that dose information is recorded remains up for debate. Dr. Frush believes that putting dose estimates in a patient’s imaging report provides little benefit to patients and referring physicians. For example, he questions whether patients or referring physicians will know whether a value of, say, 62.3 mGy, in a patient’s report is high or low. “Including radiation dose estimates in a patient’s imaging examination or procedure report record will do little to improve the patient’s understanding of the benefits and the reasons for that imaging procedure,” he says. “At best, it will be ignored; and at worst, it could cause undue anxiety for patients. “What we need to do, as a profession and for the patient and public good, is require that practices and hospitals have a dose monitoring program, where image doses are available for those who need this information, such as patients, physicians and medical physicists, auditors, or administrators,” Dr, Frush says. William Shuman, MD, FACR, FSCBTMR, FSCCT, agrees that patients and referring physicians are not as versed on the meaning of specific radiation dose levels and risk-benefit ratios, but he sees dose reporting as a starting point for education. Richard Maskowsky, RT(R)(CT)(CIIP), Radiology Information Services Manager at Midstate Radiology Associates (Meridan, CT) also believes that education is key. 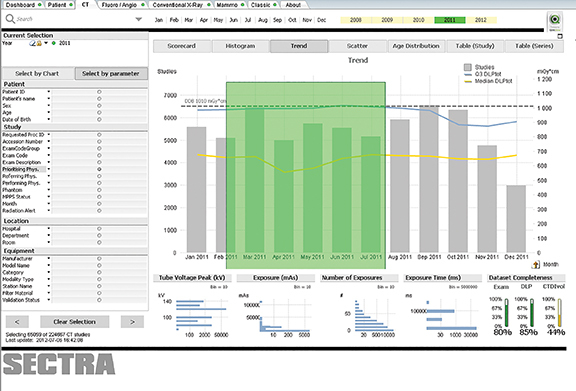 Maskowsky’s facility uses DoseTrack (Sectra, Shelton, CT), a cloud-based solution that captures information directly from the modality and provides real-time dashboards and reports. Using this information, Maskowsky evaluated dose levels on four different CT scanners and then made adjustments to the protocols so that they were all delivering similar levels across the same type of CT exam. At Yakima Valley Memorial Hospital (Yakima, WA), radiologist William Feldman, MD, and radiology manager Hal Mason, are using SafeCT (Atlantis Worldwide, NY) to lower dose by up to 60 percent. They believe technologist training is an important component to enhancing patient safety. Implementing lower dose technology on CT scanners removes any margin for error in patient positioning, Mason explains. “With exposure modulated by the mA of the scanner, positioning has to be exact.” He adds that once the CT technologists understood the implications at his facility, they embraced it. While much progress has been made the last five years in reducing ionizing radiation dose, there seems to be much agreement that the next step is to standardize dose levels for various studies — an area where dose monitoring solutions can make a significant contribution. In Seattle, Dr. Shuman is spearheading an effort to create a comprehensive dose record across the University of Washington Medicine health system. Dr. Shuman’s solution, DoseWatch (GE Healthcare, Waukesha, WI), captures information about each patient, protocol, exam and scanner that can be used to enhance patient safety and evaluate technologist performance. Benchmarking is critical to refining CT protocols for low dose. Stony Brook’s Dr. Moore credits the ACR Dose Index Registry for “helping push the envelope with the need to monitor and report dose. We have the ability to compare all similar CT scans across the country to a specific scanner model, and provide that benchmark to facilities.” While still in its infancy, the ACR Dose Index Registry can provide valuable data. Dr. Moore cites as an example a facility using a real-time dose monitoring system that had 33-percent-higher radiation dose levels than other facilities across the country. The physician administrator of that facility was able to use this data to adjust the protocols and deliver lower radiation dose to patients, he says. “Data can help drive what you do, and there is a difference between big data and usable data,” Dr. Moore says, adding that providing for benchmarking and real-time updates and warnings need to be among the long-term goals of dose monitoring solutions. Indeed, Maskowsky’s group hopes to use dose monitoring data to look at best practices nationally for the lowest dose, compare them, and make the necessary adjustments. However, an issue that he believes must be addressed is which dose measurement should be captured and how it should be interpreted. While most solutions provide alerts that a particular study has exceeded pre-determined dose levels, those alerts are retrospective. “To find out later there is a problem is not acceptable. We need to know right away,” Dr. Moore says. By monitoring and reporting CT dose, radiology departments can educate referring physicians. At Midstate, as well as at many other hospitals, radiologists are available for phone consultation. “We need to help the referring physicians to order the appropriate exam that delivers the right benefit for the patient’s situation,” Maskowsky says. “Our hope is that with prospective management and protocoling, the referring physician will know ahead of time how much dose each exam will deliver.” This approach, combined with education, can help drive more appropriate utilization of CT, he says. With progress being made on CT imaging, now may also be the time to focus on X-ray angiography and fluoroscopy. Dr. Supanich believes dose monitoring solutions have the potential to help refine dose calculation in fluoroscopy procedures. “With radiation dose structure reports, we can capture where the exam started, map where the beam was on the patient, and know where the exposure was distributed,” he says. Future capabilities could also include visualizing the entrance scan exposure. Dr. Shuman’s dose monitoring solution can capture dose from multiple modalities, including angiography, fluoroscopy, and general X-ray. Yet, as with CT, a universal method for monitoring dose across all angiography manufacturers is still needed, he said. The key to succeeding in all these areas is being able to manage what’s being measured. Medical imaging providers can use the information from dose monitoring solutions to help drive more appropriate use of imaging exams, educate patient and referring physicians on dose levels to help alleviate concerns, refine CT protocols to lower dose that meets certain benchmarks—whether those be local, regional or national standards—and identify specific patient populations that may be prone to higher cumulative dose levels. Goske MJ, Strauss KJ, Coombs LP, et al. Diagnostic reference ranges for pediatric abdominal CT. Radiology. 2013 Jul;268:208-218. Frush D, Denham CR, Goske MJ, et al. Radiation protection and dose monitoring in medical imaging: A journey from awareness, through accountability, ability and action …. But where will we arrive? J Patient Saf. 2013;9:232-238. Technology Trends: Dose monitoring solutions driving safety in radiology. Appl Radiol.